“Australia has some of the world’s strictest domestic slaughter regulations and yet Australian animals are exported to destinations that don’t even have basic animal welfare laws in place,” said Ms Heather Neil, CEO RSPCA Australia. 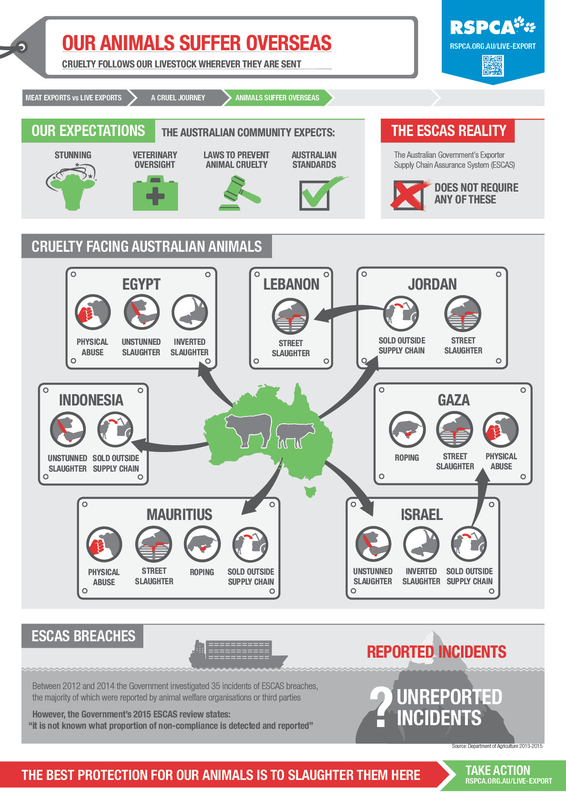 “Even with the implementation of the Exporter Supply Chain Assurance System (ESCAS), which only came about because of continued pressure from animal welfare groups like the RSPCA, horrific cruelty still continues. “The government’s own review of ESCAS clearly states that ‘it is not known what proportion of non-compliance is detected and reported’ further proof that the government doesn’t know the real extent of cruelty occurring,” said Ms Neil. “Australians have repeatedly witnessed animals being abused, shoved live into car boots, slaughtered in the street and killed while fully conscious, and this is just the cruelty we know of - imagine how much is continuing undetected. “The best protection for our animals is to slaughter them here and export meat not live animals,” Ms Neil. Third infographic available for media use.